Member's CUSTOM Name Sword PACKAGE. Available with Black Handle for standard 4th degree member or the White Handle for Faithful Navigators or Past Faithful Navigators (add'l charge). LIMIT 25 characters and spaces on each side of blade! Delivery time 3-4 months. EXCLUSIVELY MADE BY THE ENGLISH COMPANY! 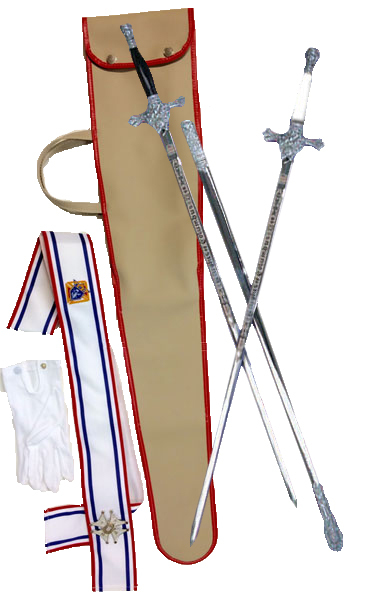 -Sword has Member's Name Etched on Side 1 and the words, Knights of Columbus or your own lettering on Side 2.
of The Knights of Columbus"
Please choose Sword Handle Color Below: BLACK for the Standard 4th Degree Member. WHITE for the Faithful Navigator or Past Faithful Navigator.